I came across this article recently in the Air Force Times and the title intrigued me: "Volunteering won't help you get promoted anymore." The article was an interview with Brig Gen Brian Kelly, who stated, "But under the new performance-driven system that is now being put into place, it will be impossible for someone to not be good at his job and still get promoted because he volunteers." The article goes on to say, "...many airmen grumbled that the whole airman concept ensured that hardworking, high-performing airman who didn't volunteer get passed over in favor of lackluster airmen who spend their Saturdays at the soup kitchen." I have to say, statements like that really get under my skin. Like REALLY. Do we really have wrench turners and fire dawgs and air traffic controllers that are not qualified to do their jobs getting promoted anyway? For enlisted airmen and NCOs, isn't a test on technical aptitude for their specific career field required for promotion? If we have unqualified Airmen (and I mean all Airmen, not just enlisted), shouldn't we re-train, and if still not successful in their job, separate? The problem that all performance evaluation systems have is that when everyone gets an A plus on job performance, other things naturally are used to delineate between the great and the exceptional performers. Then these other things gain importance. For officers, how many times have you heard that a graduate degree is/is not required and PME by correspondence is/is not required to go in residence? Everything from quarterly awards to promotion recommendations still often come down to the checking of these boxes. It would be really cool if I had some kind of recommendation or awesome idea for how to fix this. I love the idea of a 360 degree style performance evaluation, where subordinates and peers have a say also. I think our leadership needs a report card also. But one of my civilian girlfriends works with this type of system and it sounds just as time consuming and divisive as our Air Force performance evaluation and promotion systems can be. How would you fix evaluations and promotion in the Air Force? 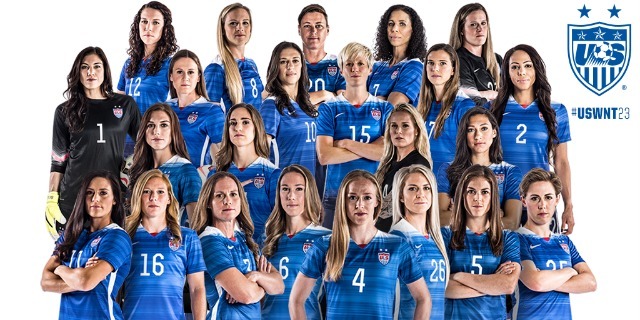 Have you been watching the Women's World Cup? Our family is obsessed. Isn't this team fierce? You must watch and cheer loudly for them! It would be un-American of you not to! Do statements like that get under your skin? Read this blog post about picking sides and choosing causes to support. It's really awesome.